Someone specifically requested a Starting From Scratch capsule wardrobe in these colors, and many of you have expressed concerns about how to implement this plan if you’re dealing with scorching hot summer weather. I really felt like I wanted to go through an entire wardrobe in one post, just to clarify and illustrate one more time how I see this project working. So here you have it! 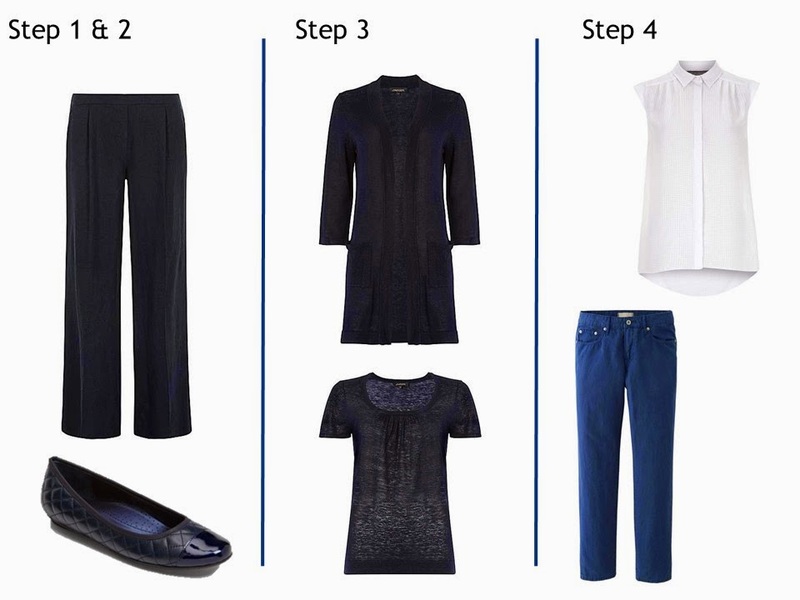 The first three steps are pretty straightforward: pants and shoes, then a cardigan and tee, then a neutral top and jeans. The biggest differences here are that I focused on linen (which I love for warm weather – if my clothes are more wrinkled than my face, it makes my face look smoother, doesn’t it?) Also, I grabbed a sleeveless white top, and supposedly “lightweight” jeans. I don’t have any personal experience with these, so I think you’ll have to shop judiciously for them. Step 8 originally included a necklace with the two accent colored tops, but I’m putting in another pair of earrings instead – cooler, I am told. Step 9 is still a skirt and a top, but a short-sleeved top, and a skirt full enough to give some air circulation around your legs. And for Step 10, I stuck with a hooded sweatshirt, thinking that you still probably need something to keep from freezing solid when you walk into an air conditioned environment. Step 11’s complete outfit is pretty similar to what I’ve done in the past – a dress rather than separates; sometimes one piece is just easier. 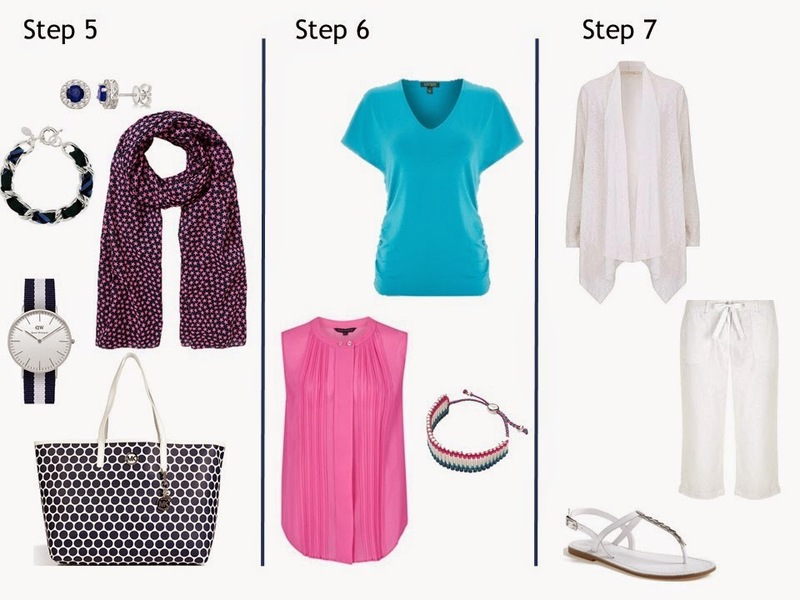 But in Step 12, I’ve gone completely off the rails of the original plan – the winter coat, boots and scarf have become a swimsuit cover-up (or lounging kaftan), sunglasses, and sandals for the beach or pool. If it’s not snowy, you can go a radically different direction with your choices! The accessories in Step 13 are quite a bit different from the usual – I stuck with two pair of accent earrings, because they’re the easiest jewelry to wear in hot weather. An amethyst bracelet will be pretty with your dress or with separates, and instead of a brooch (to WHAT would you pin it?) I thought we could use a hair band to keep the sweaty tresses out of one’s face. Too hot for necklaces, but a 2nd pair of sunglasses is only practical, and since the first pair were a vivid accent color, these in a neutral would be handy. And as much fun as it is to carry a summery tote, sometimes you need a more classic bag. 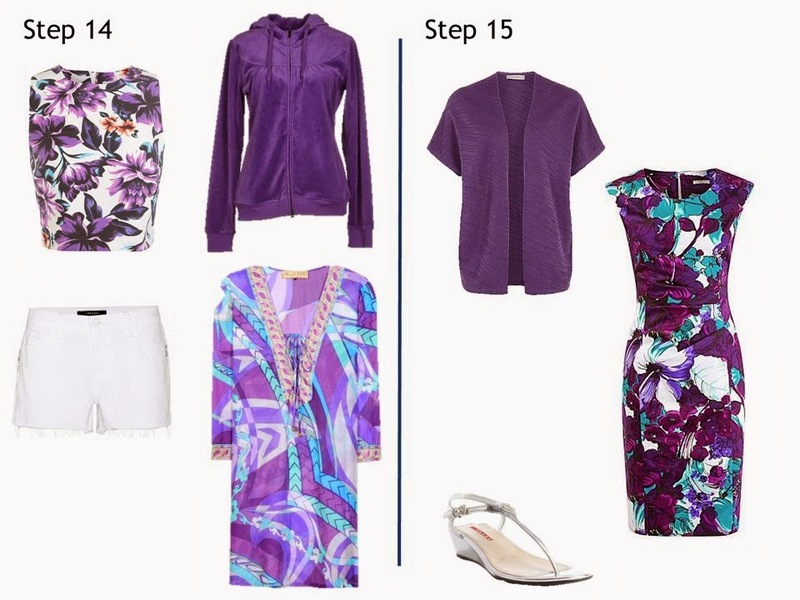 Step 17 is just another “taking stock” step, using the original concepts of the 24-piece wardrobe. This is the time to think of obvious garments that your wardrobe “should ” have – like shorts, for warm weather, and then making sure that you have these things in your core colors. Which, in fact, we DON’T have, in navy… And since we’re not really working with both long-sleeved and short-sleeved tops, I decided to opt for the most classic, easily found possible tee shirt for a navy and white wardrobe – the stripe! And in Step 18, we evaluate one LAST time, considering if we could pull together A Common Wardrobe – 12 pieces of absolutely neutral garments. We’re missing a tee shirt in our light neutral – these wear out fast, so it makes sense to stay on top of having one in stock. While a denim shirt might not be all that much fun in hot weather, a roomy chambray can make a nice change from your neutrals and brights. And just to round things out, a turquoise tank; this top almost certainly wouldn’t be in A Common Wardrobe, but we have space, and in hot weather having a lot of tops can be the difference between laundry twice and week and laundry once a week. And a wardrobe with enough dark neutral to look mature or serious if called upon to do so, but with plenty of brights and white to keep the summer thing foremost in your mind! Janice, this is fabulous! I am almost done with the fall/winter wardrobe plan and am bookmarking this for next spring. I love seeing the different ways you adapt the concept. This is completely gorgeous. I love this color combo! Thank you. This is terrific! Love the prints. I am going to combine this hot weather combo with the navy & grey combo for cooler weather. That will cover the entire year here in Orlando, Florida. Very nice! But I would swap out that headband (or one of the other accessories) for a sun hat! I especially enjoyed this post since my spring/summer wardrobe is based on navy and white here in Florida. It's pretty representative of what I own with the addition of a few casual daytime dresses ( I like J McLaughlin's for the easy wear and care fabrics in fun prints), a few more pairs of shorts and a pair of white jeans. I think what Janice has put together here would suit my entire wardrobe needs for four to five months. Thanks! I really love seeing the wardrobe "grow" in one posting. I've applied this to my own closet, which in summer is more of a denim blue and white with paler shades of pink, lavender, and turquoise. I could use more prints, but I just don't care for most designs I see. I do wear bold jewelry to balance the too-sweet pastels and I find gauzy scarves very useful in summer. Thanks, Janice. I'm not connected in any way with this, just wanted to share my enjoyment. Hope that's okay. Love it! IMHO, this type of necklace is perfect for hot summer wear. It's practically weightless, but it can give even a tee shirt just that extra bit of flare. Look also for necklaces from "seed beads" which are tiny but lovely. I really enjoy your wardrobe posts, so clever and well organised, and am thrilled to see a hot weather version. It seems more difficult to me to have wardrobe variety with fewer layers, but you've made this very interesting. I agree though, that a fabulous sunhat or two would be useful accessories. THANK YOU!!! I love these boards! They are GORGEOUS! I applied your principles, and "shopped my closet." It was actually fun. I love dresses, and since it rarely goes under 95 for 8 months, would have to swap out all but one of the cover ups with something else. Perhaps a dress or two. And, I agree with another commenter, the hair fascinator would need to be a sun hat. Now, I know that I am missing accessories, really fabulous sun glasses, and a purple t-shirt. I will need to replace my black t-shirt it is a work horse! Thank you so much for your time, and talent. You have made my life more stylish, and my world more organized! Wow! You did my wardrobe! Thank you! This is awesome! Wonderful. These are my go-to colours for summer. Been following your blog for months and am seriously considering taking the plunge with the olive, khaki, maroon and turquoise capsule. Am still a little nervous about wearing turquoise with olive. Love this post – and all the others too. First time in my life I understand how to create a good wardrope. Love this combination Janice, I can translate it to a winter collection too, as these are the colours with black instead of navy and Turquoise/Teal instead of the blue, and I bought a sunhat this year as we have been having so much sun!! Wish this was my wardrobe. Loooove the colors and I love that you put the blue shorts in there. This is really great and mutch appreciated, but to me it looks more as a summer casual wardrobe. How about starting from scratch summer proffesional wardrobe? Please? Really, really nice post. I live on the Atlantic coast of Florida where it's hot and humid for at least nine months of the year. I love the other capsules, but this one is one I can really use to shape future wardrobes down here. My biggest problem was what to substitute for scarves (which I love but overheat in), so thanks so much for addressing that. Dear Janice, thanks a lot for this series. I was working on my wardrobe then discovered your "from scratch" instrustions and followed them. I finally came up with this collection (see my Pinterest board: http://de.pinterest.com/inside9b/2015-capsule-wardrobe/) in which I incorporated several items I already own actually so I built around those. I couldn't find enough short-sleeved tops or blouses yet, but they'll probably be available here (=Germany) very soon. As I chose navy and cream as my core colors, I didn't use another light accent color, but chose coral, olive and brown to go together. I learned a lot just by reading all your blog posts, it esp. helped me choose shoes which I usually find intimidating… so I wanted to say a big THANK YOU for all the work you did and that you shared this with all of us. <3 Any comments on my wardrobe from all the nice women here.are highly appreciated. Your wardrobe is really wonderful – it's clear that you did a lot of work, and the results are beautiful! I think you will be very happy with your lovely wardrobe. This may be an older post, however so needed by me here in Sydney. Tomorrow will be 40 degrees and there is still all of January, February and March. Thank you for your guidance and hard work. I really enjoy reading your posts. Wishing you all the very best for the New Year!